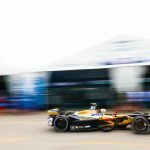 Jean-Eric Vergne converted pole position into his second Formula E victory in a captivating Santiago E-Prix, holding off team-mate Andre Lotterer for a series-first 1-2 for a team, while Sebastien Buemi fended off Felix Rosenqvist and Sam Bird for the final podium spot. The race began under beautiful blue skies, with Vergne leading away from pole position but the best start of all was made by Nelson Piquet Jr who jumped from fifth on the grid to second, while Lotterer forced Buemi further down the pack. The safety car was brought out on the first lap as Jose Maria Lopez was punted into the wall by Bird, while Nick Heidfeld also suffered contact and with it a damaged car. Further down the lap, Maro Engel also found himself in the barriers after being forced wide by Rosenqvist. Amidst the chaos, Rosenqvist moved up three places from his P14 grid slot while Mitch Evans, looking to make up for his disappointing qualifying session, moved up from last on the grid into 12th place, setting himself up for an assault on the points-paying positions. Once the safety car came in, Vergne shot away in the lead while Piquet was left to fend off the attention of Lotterer and Buemi, but it didn’t take long for the Brazilian to catch up to his French rival. However, whilst mounting an attack Piquet ran into the back of Vergne, detaching the Techeetah’s rear left wheel pod in the process. From there Vergne started to gap the field and built up as much of a lead as possible before the pit stops, which no longer require the minimum pit stop time, but not before Lotterer made the most of a lack of pace for Piquet and took second place away on lap 19. With the pit stops completed, Vergne kept the lead ahead of Lotterer and Piquet, while the biggest winner was Rosenqvist who moved up into fifth place while Bird stayed out a lap longer, but ultimately came out in seventh. Following on from strong opening stint Lucas di Grassi ran into trouble following his pit stop as he stopped on track, continuing his reliability woes and leaving Santiago still on zero points in the championship. Lap 28 saw retirement for Alex Lynn, who had been comfortably running in the points but a technical issue forced the Englishman out of the race. Shortly after, Buemi made a move on Piquet for third place and a potential podium place. 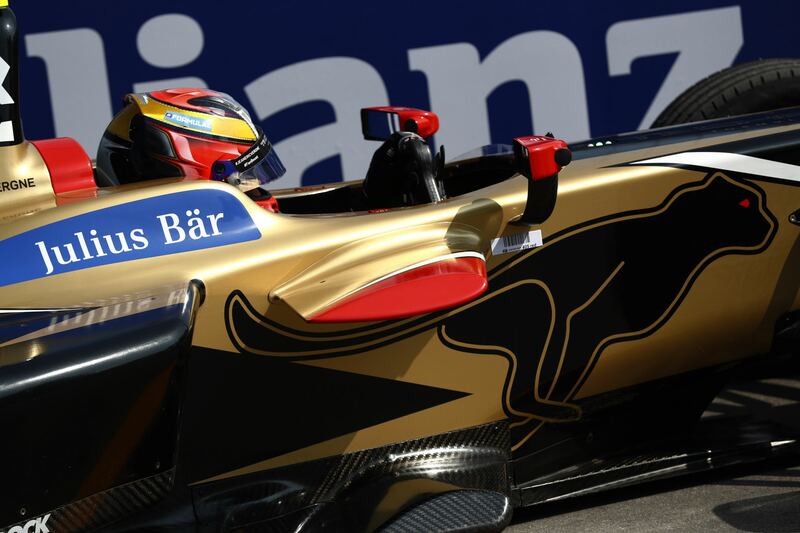 Ahead of them the Techeetah duo started to battle for the lead and almost came to blows as Lotterer made a move around the outside but was forced wide by Vergne, who kept the lead. Piquet then attempted to regain third place from Buemi but went straight on and surrendered fourth and fifth to Rosenqvist and Bird, while Lotterer worked on closing Vergne back in. Lap 33 saw the German nurf the back of Vergne, with both lucky to make the corner as the pack behind them closed in. With the top five in the same camera shot with four laps to go, it was anyone’s race as the quintet of drivers jostled for positions on the bumpy track. With the Techeetah duo on the ragged edge to the line, Vergne did everything in his power to keep Lotterer behind him and ultimately prevailed for his second win, taking with it the lead in the championship ahead of Rosenqvist and Bird. 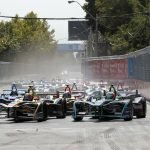 Panasonic Jaguar Racing took a double points finish with Piquet coming home sixth while a mega recovery drive by Evans saw the Kiwi rise from last in the grid to a seventh place finish. Jerome d’Ambrosio brought home his first points of the season in eighth, while Antonio Felix da Costa and Nico Prost rounded out the top ten.